Ok, so one of the heated topics, particularly within stateside otaku culture is the issue of cultural (mis)appropriation. This is a valid, sensitive topic that I know effects my fellow classmates, with deep roots in colonialism and I don’t want to assume anything or say/do anything offensive or be insensitive. The presentation on Monday, thank you for everything you shared and helping me to begin to understand and change the way I think about the cultures, communities and people that make up PI(A) and the broader API(A) cultures. Asian and Asian/American studies, combined with film and media studies are what my BA and MA focus are. I would be an idiot, “baka”, to assume (mis)appropriation effects different cultures the same way, to think that within these cultures that all of the populace views the issue the same way and there are too many important components to generalize, anything. So that I don’t generalize and ignore the intricacies of this topic, I’m going to look at (mis)appropriation from the cultures I have the most familiarity with, which is otaku, Japanese, American and my growing understanding of Asian/American culture. Also I’ve noticed that the words “misappropriation” and “appropriation” are used interchangeably, with “appropriation” being widely favored in the media, despite having different definitions initially, so I will be using the term “(mis)appropriation” to acknowledge the use of both words and their combined meanings. So, one of the main things I am, finally, beginning to understand no longer in vague, broad strokes, is that Asian and Asian/American culture are different. I knew they were, I wasn’t completely ignorant and culturally isolated, but I didn’t know how and in what ways they were. For a little background on what previously shaped my perspective, most of my actual, not otaku, experience with Asian culture was with recent first generation immigrants and international students at my previous college. The students I interacted with the most were learning English as a second language, mostly from Hong Kong and South Korea. Outside of the college, I worked with first generation immigrants where I learned, mostly about the conflicts between Japan, Korea and China, within Japan, Korea and China and very little on the history colonialism had in them, which to me seems either odd now or the absence itself is evidence of that colonialism. Normally I would be embarrassed to say this, but prior to coming to Evergreen, I really didn’t know anyone who identified as Asian/American because there wasn’t anyone. If there had been, along with diversity in general, coming to Evergreen would have been, less of an adjustment than it has been. An adjustment I’m glad to be going through, finally growing as a human being instead of being stuck in the rotting wasteland of a former logging town. Cause before I was used to either “Asian” or “American” and pretty much knew nothing of the “/”. I’m sorry if I have acted or have been acting like a complete idiot. Anyways, to bring this back into the topic of (mis)appropriation, and where specifically in otaku culture with Japanese culture, I could start to see where the issue on three very basic levels: the Japanese point of view, the Japanese/American point of view and the colonialist American point of view. Because of time and space, I can’t go as in-depth as I would like (and need), but I will do my best to be clear and percise with my words to avoid misunderstandings. Here in America, and given that the painting is of a white women in a kimono, I, as mixed raced and otaku that has grown up in America, say that this is cultural (mis)appropriation with the kimono event and was ignorant and disrespectful to Japanese/Americans. If the painting was alone on a wall as part of a normal Claude Monet exhibition, and given it was painted in 1876, I would not view it as an issue or even use it as a talking point to educate the public, not only on Japanese/American history, but also APIA history like our text “Asian American History: A Very Short Introduction” does. Also an introduction that does not mash up all of the different countries and cultures like “Moana” does with IP(A). But once the museum added the wear a kimono fun day event during that summer, without trying to educate on the history of the painting, Japanese culture, the Japanese people, Japanese/Americans, how they were viewed at the time of the painting and the issues with cultural (mis)appropriation in America now, any acknowledgement, it became cultural (mis)appropriation. That is my stance on this exhibit. As an otaku though, I have a general understanding that the Japanese, meaning Japanese living in Japan with their own distinct mindset, politics, experience and history that is different from Japanese/Americans since this painting was painted in 1876. For this I have this video from YouTubers Rachel and Jun, a Japanese/American married couple who live and make videos about their lives in Japan. This was the video that helped me to understand, specifically in stateside otaku culture, why cultural (mis)appropriation and where otaku stand on it in regards to anime, manga and Japanese culture, is all over the place. 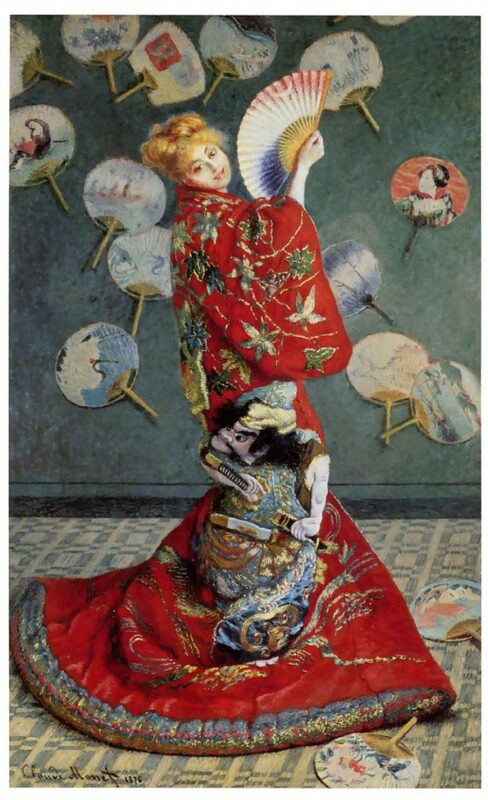 It is also why I didn’t use the Japanese themed birthday party example again (as also my views on what is and isn’t (mis)appropriation have changed since then) and instead used the Claude Monet painting. It automatically brings in that critical historical dialog that is present and can’t be ignored today America, where as in Japan there is a different historical dialog and different issues that are the focus of present day Japan. Japan’s willingness and encouragement of their culture being shared is a common sentiment, which those in the otaku community are generally aware of, but because the stateside otaku culture is just that, stateside in America, it is difficult to know where the line is, for those not Japanese or Japanese/American, for what is and isn’t cultural (mis)appropriation. For the most part, in the otaku community, for special events such as conventions, cosplaying as specific characters, food, music, media, merchandise (and cats), are generally not seen as (mis)appropriation. This would include wearing kimono and participating in traditional Japanese activities at cultural events where the history, people and culture are acknowledged. It is often an excellent opportunity to learn more, and have a deeper appreciation and understanding of the culture that is very openly being shared. Where things get dicey are with the American otaku who, for simplicity, would wear a kimono everyday in public and are not Japanese or Japanese/American. Do they have the freedom to wear a kimono everyday in America, so long as their reasons are non-harmful? Yes they do, but while they may have that freedom with permission from the country of origin and enough understanding of Japanese culture to put on a kimono and wear it everyday, that person must realize they are in a country that still to this day (mis)appropriates in mass, regularly does not acknowledge the histories (and the crimes) it has committed against the minorities it (mis)appropriates from and still actively engages in colonialism. So while it may be welcomed in Japan, here in America it would be insensitive and inappropriate on an everyday basis due to its long history of colonialism, and from my perspective it would be better to reserve wearing it for special occasions, like conventions and cosplaying.